Traveled to a big tourist city last week. After three days of ghastly airline, airport, and convention center food, I splurged on a fancy hotel restaurant that billed its cuisine as “local” (or at least, “regional”). What a hideous and expensive mistake. There are more and more of these tourist-targetting restaurants that serve faux-fancy cuisine. Some executive chef comes in and designs a menu, then leaves. A team of low-end cooks slavishly follow the assembly directions, with no modifications based on the quality of the actual ingredients. 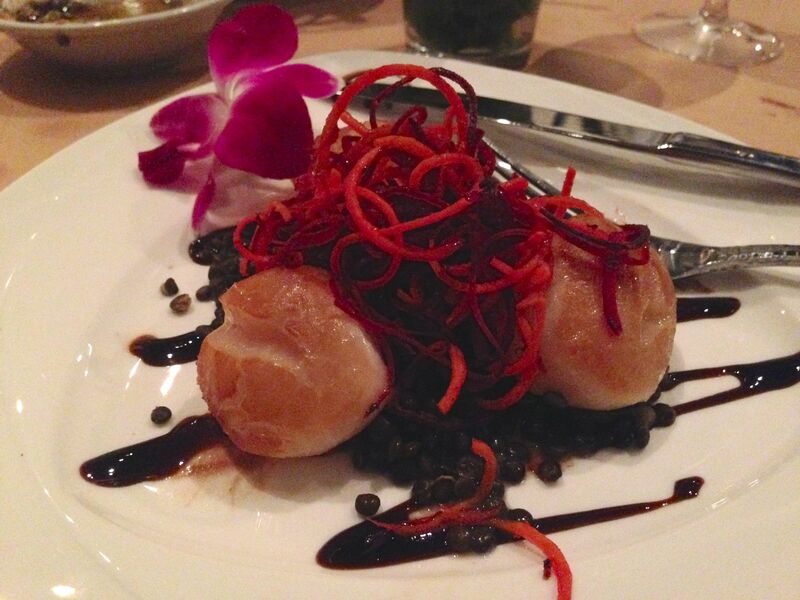 I don’t know what was worse that night — the horribly, flabby, thawed shrimp passed off as local or the beautiful fresh scallops tainted with painted-on high-sodium artificial smoke before being seared in a pan of questionable grease. Avoid these places like the plague. Your first clue is the menu: Each dish has three ingredients that, in juxtaposition, raise the eyebrows rather than whet the palate. 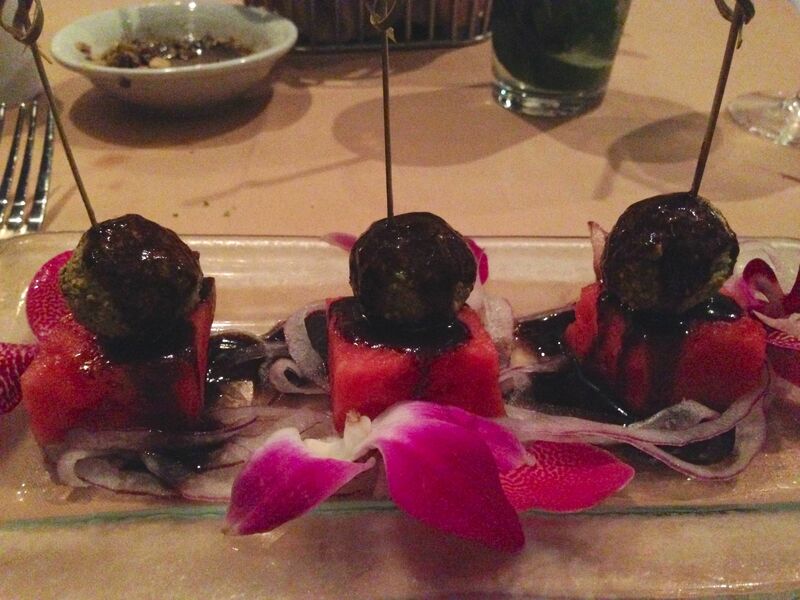 Watermelon chunks topped with large balls of goat cheese with a side of onions and orchids, anyone? The second clue is the dinnerware: Gigantic white plates in weird shapes — rectangular, triangular, trapezoidal. Give me a break. The third clue is the sauces: Salty, fatty and so highly flavored with hot pepper, mustard, or spices that they obliterate any flavor that the main dish might ever have had. 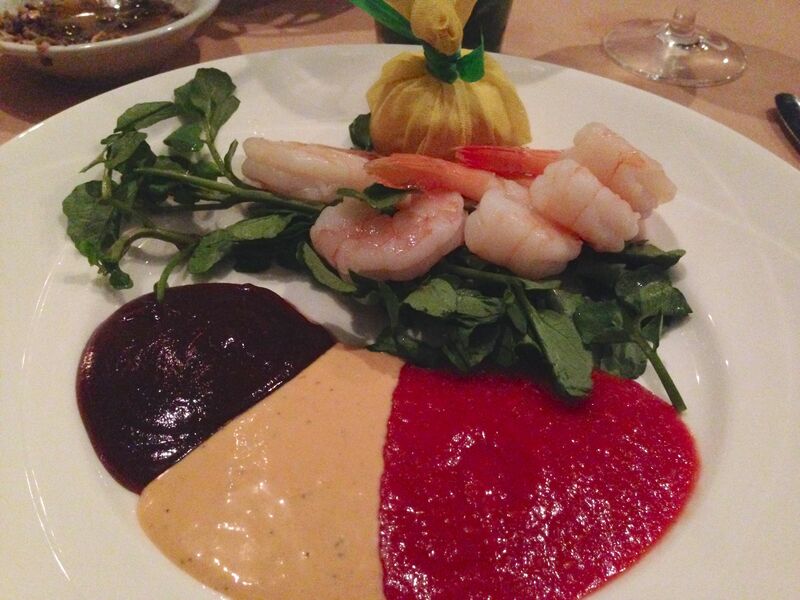 Finally, the damning fourth clue: A gluey version of balsamic vinegar zig-zagged artistically over your food and the trapezoidal plate. For dessert, it’s raspberry-balsamic glue for the zig-zag. I wanted to cry — particularly for what must have been delightful scallops before they were poisoned with artificial smoke flavoring. The next day I set out on the road and found myself in a small rural community. At 12:30 p.m. the downtown burger pub was filled with people drinking like fish (cocktails AND mugs of beer?). I got the basic lunch — a hamburger that could have fed three people, a mountain of fries, and a 24-oz. plastic glass of ice-cold Coca-Cola. I ate the beef patty (quite good) and the tomato slice (fresh, and local) and had a few sips of Coke. You know what? It was about 10 times better than the previous night’s dinner. And so was the service. This entry was posted in Dining Out, Fashion. Bookmark the permalink.